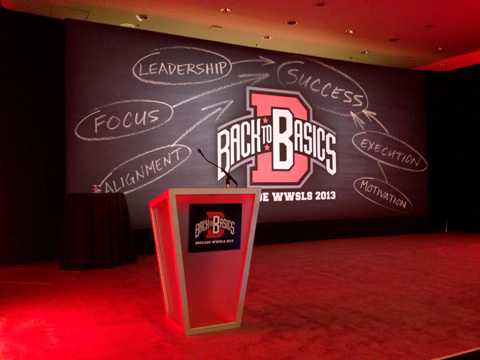 Brocade World Wide Sales Conference 2012 — John Murray Productions, Inc. Brocade's World Wide Sales Conference is not your average sales conference. Each year, Brocade employees from around the world come to the Bay Area to face off in a competition designed to fire up their competitive spirit, and this year the challenge cup consisted of a boot camp style obstacle course. Working with PS Communications for the third year running, John Murray Productions designed and built a course that included a balance beam, fire pole climb, tunnel crawl and a run across stepping stones. The challenge came in designing a demanding course that was safe for the participants, while testing their agility in a fun and interactive manner, all within a the Westin St. Francis ballroom. The balance beam consisted of a 3' high plank that zig-zagged for 17' linear feet. Foam barriers and landing pad protected participants from any falls off the beam. The fire pole climb required the teams to climb a pole, grab a flag, and slide back down, a challenge that proved to be more difficult than expected! The tunnel crawl featured a 12' x 3' in diameter tunnel through which the participants had to crawl, and the 1' high stepping stones were positioned in a zig-zag formation requiring the challengers to leap from step to step. JMP also designed the stage set for the event, which featured a large printed backdrop, and back-lit GLO walls that acted as dynamic screen surrounds for the two screens flanking the stage. 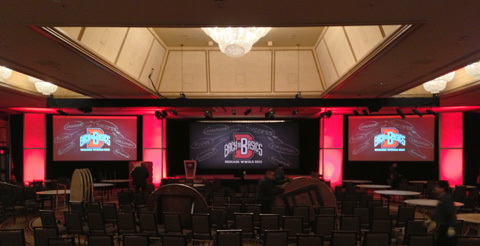 The red, black and white look was brand appropriate for the computer technology company, and the event a huge success. Photos courtesy of PS Communications.